Regular aquarium cleaning and water replacement are crucial for fish welfare. Algae and waste accumulation in the tank increases ammonia and reduces oxygen levels,which lead to several diseases, as contaminated water contains waste, toxins, and pathogenic microorganisms. Aquarium should be cleaned once a week to keep fish healthy and happy. Unplug the aquarium before starting and wear rubber gloves during cleaning. Any equipment or cleaners from a kitchen and/or bathroom is not appropriate for aquarium cleaning, as they may contain chemicals and detergents that can poison the fish. Aquarium decorations should be removed from the aquarium before transferring the fish to the other tank. The fish net is useful for transferring your fish to the temporary tank. Water in the temporary tank should come from the original water in the aquarium to protect fish from shock. 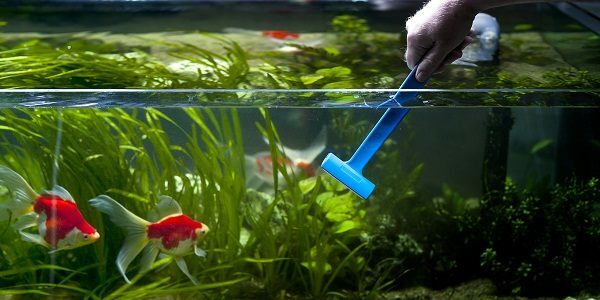 An algae pad, or scrubber, is useful for removing algae build-up on the aquarium glass. It will stick to the aquarium glass and make removing the algae easier. Sometimes it is necessary to scrape the aquarium glass with plastic blade to remove the algae as well. The pad is also great to clean tank decorations. If the algae accumulation on the decorations is too much, it may be necessary to change the water more often and feed your fish less. Use the siphon from the gravel vacuum for the water and gravel cleaning. Gravel cleaning is important to remove all the fish waste and extra food. The siphon is not strong enough to vacuum the gravel particles on its own, thus push the vacuum into the gravel to get all the fragments. If there is a sand layer, only use the hose part of the siphon to go 2 centimeters from the surface. More than 75% of the old water shouldn’t be taken from the tank in order to keep beneficial bacteria.Once a week, 10-20% water changing will be enough to keep beneficial microorganisms inside. If there are sick fish in the aquarium, it is recommended to change 25-50% of the aquarium water to protect the other species in the tank. Use a clean sponge without any soap or chemicals to wipe down the inside of the aquarium after you cleaned all the algae. Wash the filter cartridge once a week, regularly. It is also important to change the cartridge once a month because carbon inside the cartridge can poison the fish. Replace the all decorations and equipment in the tank after all cleaning is complete. Next, fill 90% of the tank with fresh water that is the same temperature as the replaced water.At this time, all devices can be plugged back in. Add water conditioning if needed, after the tank stabilizes for 15 to 20 minutes. Later, transfer the fish back to the clean aquarium. The water temperature of a new tank should be optimal for the fish. Fish shouldn’t stay in the temporary tank more than 30 minutes. Any kind of chemicals, including soap, shouldn’t be used for aquarium cleaning. These products are toxic for fish. As a result of water evaporation, salt can accumulate at the top of a marine tank;salt creep should be removed with a sponge. 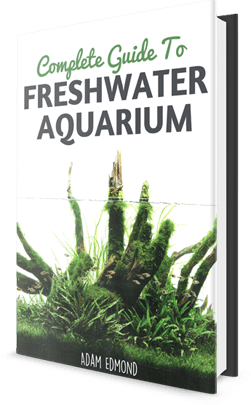 Adding water in to a marine aquarium is more complicated than freshwater aquariums; all parameters such as temperature, salinity, and pH should be in the optimal range. Therefore, add the saltwater solution to the aquarium the night before the cleaning and check all the parameters in the morning. The salinity of the water should be between 1.021 and 1.205. Moreover, temperature is critical to keep your fish healthy. The optimal temperature range for marine fish is between 73-82° Fahrenheit (23-280C). As an alternative, a magnet method can be useful to clean all the algae and dirt. Place half of the special aquarium magnet inside of the aquarium glass and the other half outside the glass facing each other. Slowly, move the outside magnet to guide the inside magnet to scrape off the algae. Just remember to change the pads for the next cleaning. Aquarium Gravel Cleaner: Time for a Water Change?